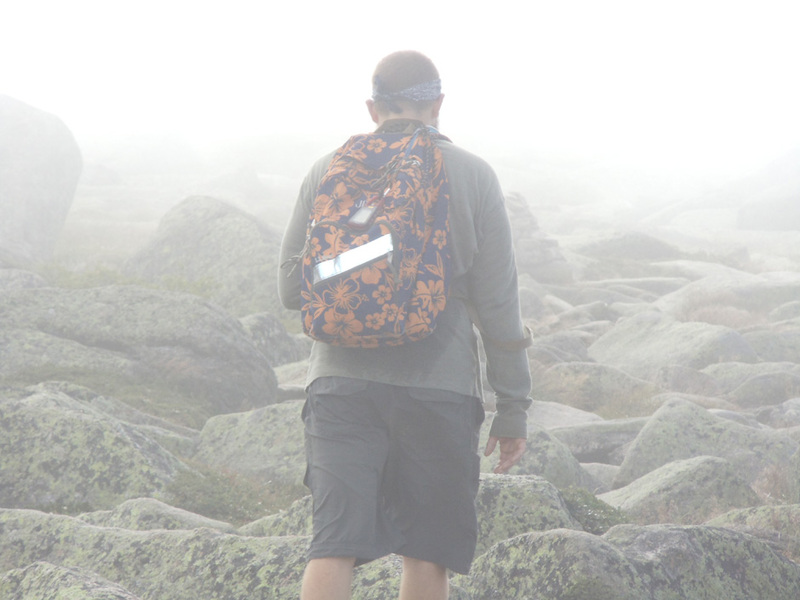 If you’d like a full-day hiking experience with all the quad-burning challenge and beauty of the White Mountains, minus the crowds, then the Bigelow Mountain Range in western Maine is surely for you. Once dubbed the tenth hardest day hike in America by Backpacker Magazine, the Bigelow Range traverse offers a series of rock-studded peaks connected through a string of emerald ridges, deep cols, and hearty climbs. 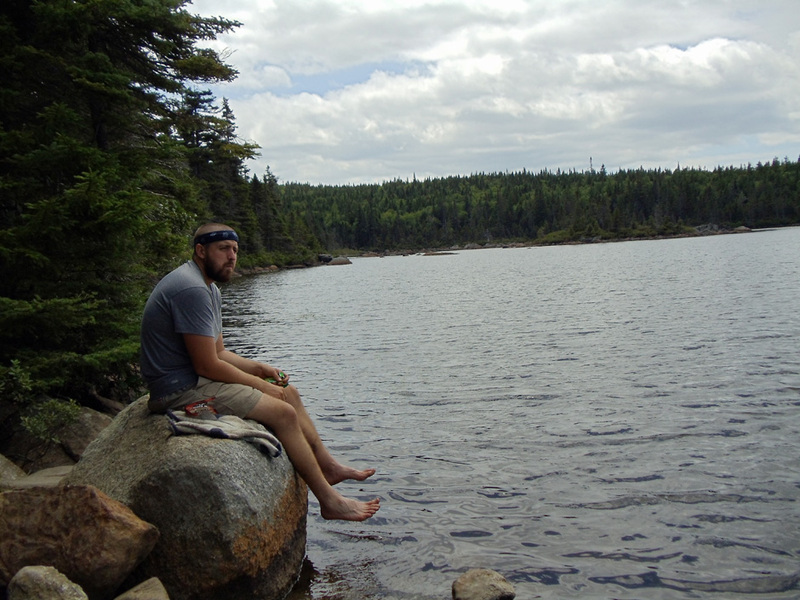 Many people, myself included, view the Bigelow Range as Maine’s second-best hiking destination, the bridesmaid to only Katahdin. 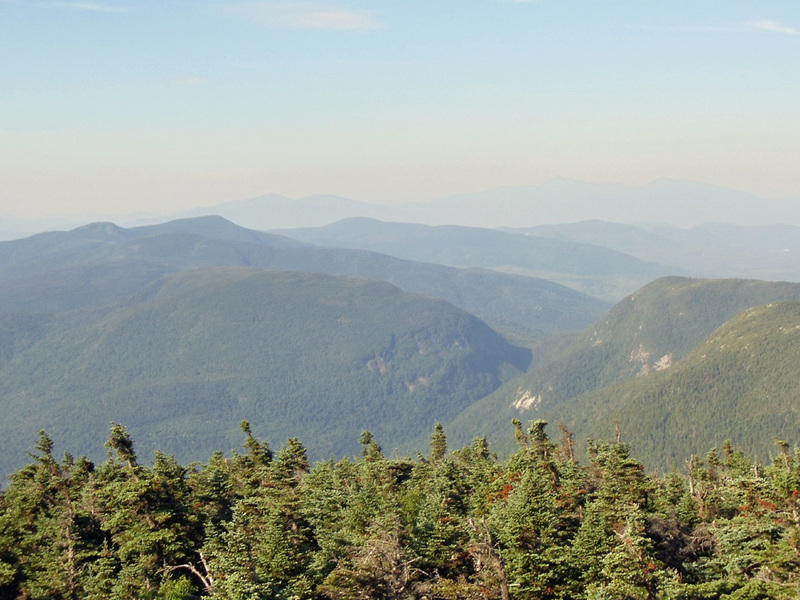 Like Katahdin, the Bigelow Range is steeped in history. The range is named after Colonel Timothy Bigelow, a blacksmith from Worcester, Mass. who became a leader in Benedict Arnold’s ill-fated march on Quebec. Before Bigelow was captured, he is believed to be the first-known white man to climb the mountain, a feat he accomplished “for purposes of observation” in an attempt to see Quebec city. The view Colonel Bigelow observed in 1775 didn’t include the city, but it was vast and significantly different than what we see today. His ascent occurred well before the Long Falls Dam was installed in the Dead River in 1950, drowning the township of Flagstaff and turning a small natural lake into the amorphous sprawl of Flagstaff Lake. It’s hard to imagine, but the range’s enchanting views of Flagstaff Lake and the surrounding wilderness were nearly marred in the 1970s by plans to turn the north slope of Bigelow into a giant ski resort, complete with condominiums, businesses, and even an airport. 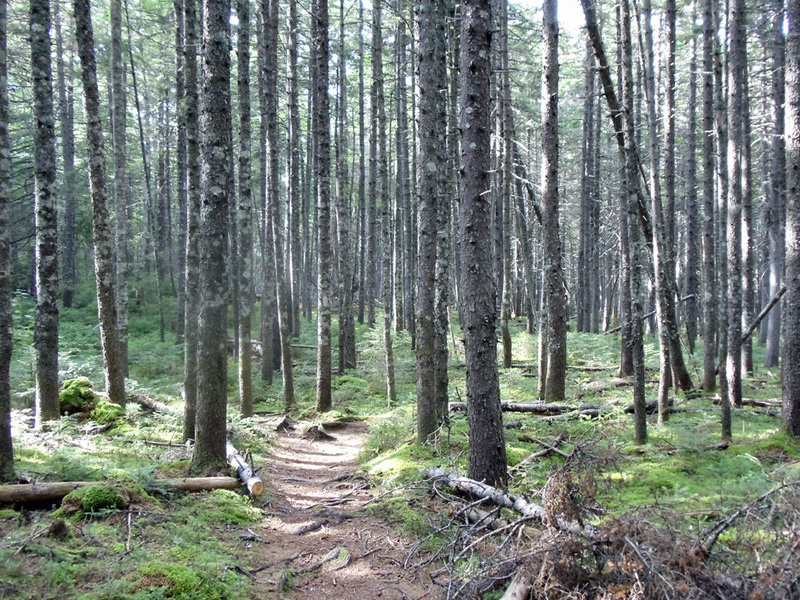 Thankfully, opposition to the “Aspen of the East” plans by the Friends of Bigelow, the Maine Appalachian Trail Club, The Natural Resources Council of Maine, and the Appalachian Mountain Club forced a state referendum, which led to the Bigelow Preserve with over 36,000 acres of public land for outdoor recreation. Amen. Don’t mind the sign, it’s only a 16.3-mile Appalachian Trail hike to the Stratton Brook Road. 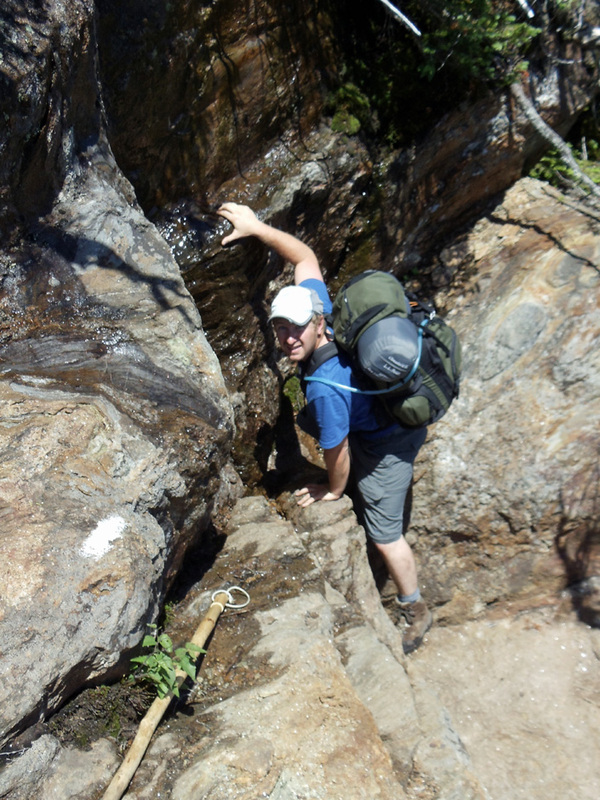 Having previously completed the Bigelow Range traverse from the western end on a northbound AT track, this adventure was tackled from the eastern side as a SOBO hike. The sign in the photo above lists the full hike at 17.3 miles, but there’s an access point on the Stratton Brook Road that cuts off a leisurely mile to Route 27. Either way, you’ll likely need to arrange pickup/drop-off on one end or the other, or leave a vehicle at each end (driving directions are at the bottom of the post). The SOBO Appalachian Trail ascent of Little Bigelow begins with a gradual climb that’s relatively free of obstacles for the first 1.4 miles to the Little Bigelow Lean-to. While this write-up is from the perspective of a day-hike, this lean-to is one of six designated campsites throughout the range for anyone inclined to make a weekend of it. From here the trail gets steeper and after another quick 1.7 miles, it reaches the eastern end of the Little Bigelow ridge. There are several vantage points along the ridge, the height of which is 3,040 feet, with stellar views of the northern Maine woods, Sugarloaf Mountain and the surrounding ranges, and Flagstaff Lake. This day started off with high cloud cover, which kept Sugarloaf visible from Little Bigelow. There’s one point where the trail turns along the edge of a cliff, so it’s best to exercise caution in this section, especially on a winter hike. And then I saw this cool trail sign. Little Bigelow is a range unto itself, and the constant up and down can be frustrating for the already weary NoBo hiker. For SoBos it’s a grueling 6.4-mile warm-up act for the punishing peaks and valleys of Bigelow Mountain. By virtue of having not yet succumbed to the beatdown of big-bro Bigelow, it’s easier for SoBos to appreciate the ridgeline greenery. Walking the ridge along Little Bigelow. On a good-weather day, all sweat is rewarded with grand views. Looking down upon Flagstaff Lake from the western end of Little Bigelow. From the western end of Little Bigelow the trail drops approximately a 1,000 feet in elevation into Safford Notch. There are side trails for the Safford Notch Campsite and the Safford Brook Trail at this juncture, but the real attraction is the motley collection of gigantic boulders. It’s impressive to think about these house-sized marbles being carved out of the mountain by glacial ice. One of the many Safford Notch boulders. Now that the “practice” hike of Little Bigelow Mountain is over, the trail begins its climb to Bigelow’s signature Avery Peak, elevation 4,088 feet. The ascent might as well be up an elevator shaft, gaining approximately 2,000 feet of elevation in two miles. The trail escapes treeline shortly before reaching Avery peak, and believe you me, escapes is the appropriate sentiment. The gain for this pain? Another round of Flagstaff views awaits. The cloud cover granted me with an interesting half and half perspective. Avery Peak is also the home to the foundation pictured below, the remnants of an old fire tower. 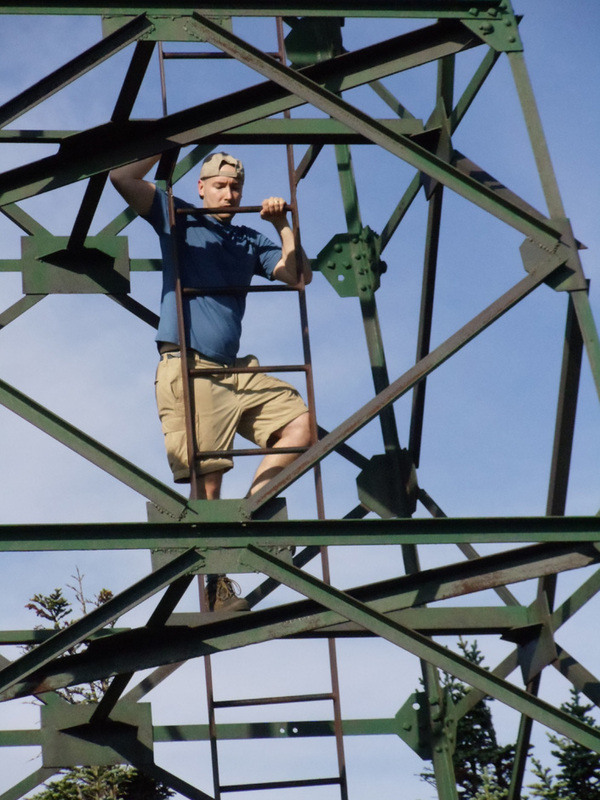 I recall seeing the tower intact on my last Bigelow hike in 2010, albeit the glass windows were removed and boarded up, and was surprised to discover only the foundation this time around. According to the Irregular, the watchtower was intentionally burned in April of 2011 by the Maine Forest Service to prevent vandalism. I imagine there was a safety component to this as it was known that AT hikers would occasionally break in and camp out. 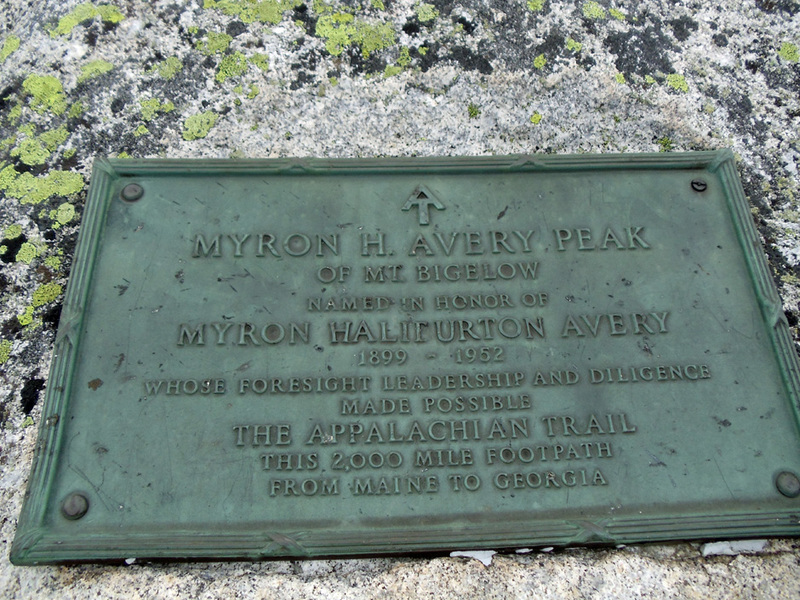 Avery Peak is named after the esteemed Myron H. Avery, who was Chairman of the Appalachian Trail Conference from 1931 through 1952. 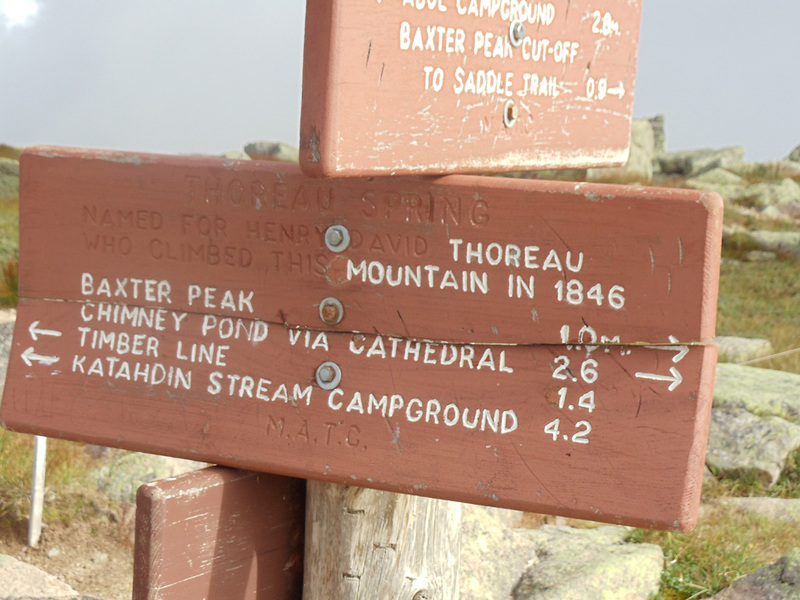 A Maine native, Avery was instrumental in extending the northern terminus of the Appalachian Trail from Mt. Washington to Katahdin. He founded the Maine Appalachian Trail club in 1935, recruited volunteers to develop the trail, personally measured the original 269 miles, and gave generously of his time to trail maintenance. The final approach from the old watchtower foundation to the summit of Avery Peak. Bigelow Mountain’s Avery Peak, elevation 4,088 feet. As you can see from the picture above, the sign and post are brand new. Kudos need to be given to the Maine Appalachian Trail club as the trail throughout this entire section was in immaculate shape. All blazes were freshly painted, and each of the summit signs had new posts (though it was funny to see a freshly chopped tree just before each peak). Heading south from Avery Peak, the trail descends a narrow alley of jagged rocks for 0.4 miles before reaching the bottom of the Bigelow Col. The Appalachian Trail just south of Avery Peak. The Bigelow Col is home to the Avery Memorial Campsite, where there’s a collection of well-cared-for tent platforms and the junction with the Fire Warden Trail, which leads down to the Moose Falls Campsite. I originally planned on staying at Avery for the night on this trip, something I’ve long wanted to do, as it’s one of the most outstanding places to camp on the Maine Appalachian Trail. Alas, it continues to elude me, my personal white whale of camping. A tent platform at the Avery Memorial Campsite. The next stop on the tour is Bigelow’s summit, the West Peak, which is a mere 0.3 miles from the Avery Campsite. The view of Avery Peak from treeline on Bigelow’s West Peak. Bigelow’s summit, the West Peak, elevation 4,145 feet. Looking across the ridge from Bigelow’s West Peak to the Horns. The trek from Bigelow’s West Peak to the summit of South Horn is 2.1 easy miles. Shortly after the South Horn summit there’s a side trail to North Horn, which I omitted on this traverse. On the descent of South Horn I could hear the echoes of children playing around Horn Pond, and while I didn’t encounter these wild beasts, a short chat with the caretaker for the Horns Pond Lean-To was in order. For SoBos there’s one last climb (albeit short) from Horns Pond to an overlook. Looking down upon Bigelow’s Horns Pond. From Horns Pond Lean-To, it’s 4.3 miles to the Stratton Brook Pond Road. Compared to the hike up Little Bigelow on the eastern side of the range, the Appalachian Trail on the western end is steeper, rockier, and even the roots are gnarlier. 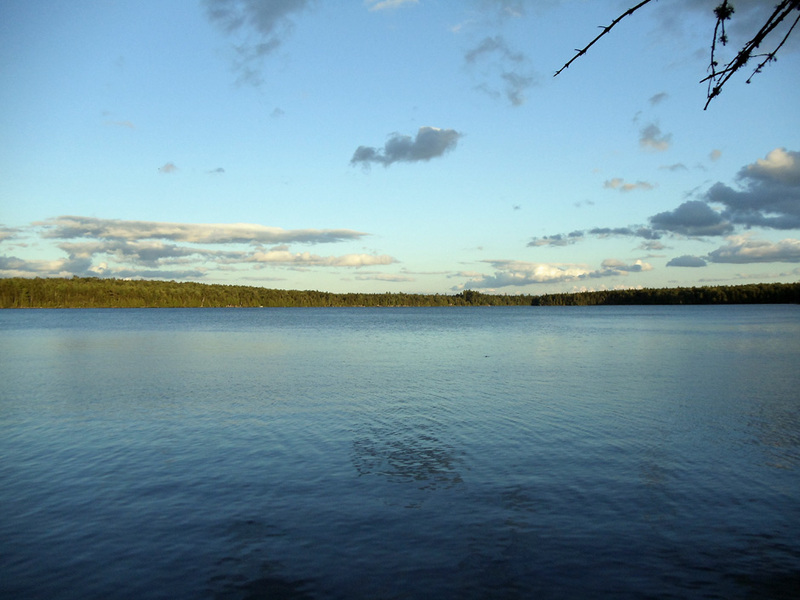 There are two connecting trails on this stretch, the Horns Pond Trail that crosses over to the Fire Warden Trail, as well as the Bigelow Range Trail, a favorite of locals because it crosses 3,213-foot Cranberry Peak. Sticking to the Appalachian Trail, the Cranberry Stream Campsite is located a short 1.1 miles from the Stratton Brook Pond Road. 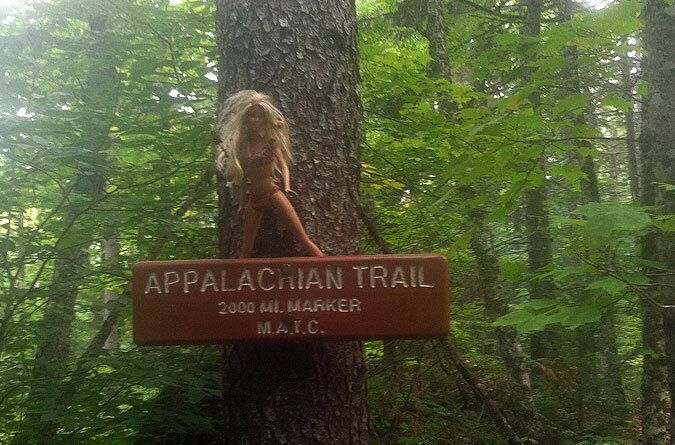 Look, Appalachian Trail Barbie, if you can’t hack Bigelow’s ups and downs, you’re better off staying in town. Get in your car and drive to Carrabassett Valley, Maine via Routes 27 and 16, the journey for which is going to feel like it is taking an eighth of your lifetime. Triple this time warp if there are young kids in the car. For the eastern end of the range, take the Carriage Road off 27/16 in Carrabassett Valley, follow it to the end and turn left onto the Bog Brook Road. Shortly after this turn, veer left again onto the East Flagstaff Road; the trailhead is only a 100 yards or so on the left after this intersection; there’s a parking area on the right just prior to the trailhead. For the western end of the range, continue on 27/16 into Stratton and take the Stratton Brook Pond Road, which will be on the right for those driving north. You’ll know that you’re getting close to the road when you pass the Appalachian Trail crossing. There’s a small parking area on the left of the Stratton Brook Pond Road just prior to the AT junction. Continue on the Stratton Brook Road if you want to hike the Fire Warden Trail.